Personal connection is always important whether you’re applying for admission to an academic program or for a job. The more we talk and email, the more we know about you and understand your background and goals. We are here to help. Remember that when the Fisher admissions committee makes its decision on applications, it not only bases its decision on whether we think you’ll “fit” the program but also whether we believe the program can provide what you’d like to get out of it. Have questions? 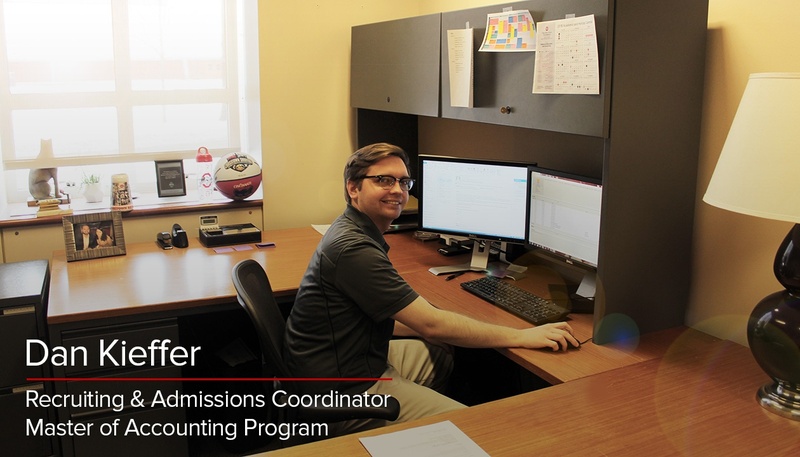 Contact Dan Kieffer, Recruiting & Admissions Coordinator, for the Master of Accounting program. It’s important that you know what you want before you apply to any graduate program. Do research on your end and determine if the Fisher Master of Accounting program is the right program for you. The admissions office can tell right away if you’ve done your research when we are speaking with you. Realizing you’ve done some research on your program indicates that you have a strong interest and can help you to stand out from the candidate pool. Asking questions is a good sign that indicates your interest and can lead to some helpful conversation for both the admissions team and for you. However, be sure to look through the Frequently Asked Questions page to see if your question has been answered there. You are more than welcome to ask any specific questions and we usually reply within two business days. Hope those tips are helpful. Good luck! Previous Previous post: My First Winter Break in the U.S.